Carlos was born in Mexico City where he began his musical education at the age of 15. Though he began learning music without the intention of doing it in a professional manner, afterstudying for a year, he realized that he wanted to pursue it as his professional career. Carlos began his formal education in 1986 when he enrolled to attend "Music High School" which was a 3 year curriculum that allowed him to get all the basics needed to become a professional musician. Once having completed that program he continued his education by attending the "Fine Arts School" where he spent another 3 years and graduated with a Bachelors Degree In Fine Arts and the highest GPA of his graduating class. During his last year at the University he started attending a private school called Estudio de Arte Guitarristico (Guitar's Art Conservatory) where he graduated after two years with a Masters Degree in Classical Guitar. All along his formal education Carlos was actively performing throughout the country with various groups and ensembles; his experience playing different styles of music include Classical Music, Chamber Music, Traditional Folk Music, Latin-American Music, Andean Music, Spanish Music, Jazz, and Instrumental Music. Although he performed playing different instruments, his forte has always been the Guitar. Carlos has performed as a soloist with a Chamber Orchestra, in different classical and popular ensembles, in a Duet that performed all over the country for all kinds of audiences from the private recital theaters to the formal concert halls where they were always complimented for their work. Carlos has also performed for T.V. and Radio stations for different events. He also taught for about five years at different institutes as well as privately. Carlos has been in San Antonio for almost six years and has performed as a soloist in numerous occasions and in many different places such as The San Antonio Museum of Art, several schools within the Northeast School District and also in places like The Dominion Country Club, Sonterra Country Club, The Westin at La Cantera, The Westin Downtown, The St. Anthony Hotel, The Hilton Downtown, Club Girard and many other private locations as well. 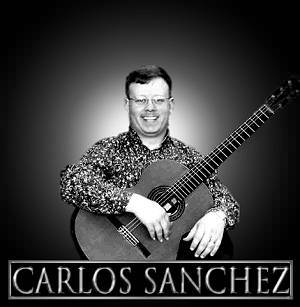 Carlos plays a wide variety of styles such as Classical, Jazz, Movie themes, Soft music from different artists, Flamenco/Spanish music, Latin-American music, Mexican music as well as some original works by him. His music can be used as background music or to be played in a recital.